6 Responses to What’s your view on customers’ value to innovation? Good post, Hutch. I’ve been thinking about this issue recently too. I agree with you that firms need to put the customer in the center of their activities – particularly when it comes to innovation. Eventually, it’s the customer determining adoption and therefore innovation success. However, customer involvement and the way of putting customer value in the center differs along the innovation spectrum. Innovation in existing markets often refers to improvement or enhancement of exisitng offerings. It covers debugging, adding new features, launching new versions etc. These innovations can be well based on customer research and co-created as the already existing offering as the frame of reference is not left. When it comes to entirely novel offerings through more radical innovation, often related to new market creation, customer involvement needs to be different. A “customer knowledge chasm” exists, as average customers tend to stick to existing frames of reference and have major difficulties in conceiving of novel frames that do not yet exist. That’s why Verganti suggests that entirely new solutions are “proposals” from the innovator to the market that need to become validated. Of course these proposals need to address (unmet) customer needs or jobs-to-be-done and must not be developed in a “vacuum”. Involvement of selected edge customers (e.g. lead or creative customers) is likely to help bridge the chasm to the mass market. I think the role of customers shifts from providing solution requirements and specifications to validating proposals as we move along the innovation continuum from incremental towards radical and disruptive innovation. Across the entire continuum, however, innovative solutions need to be build around customer needs. The more radical the innovation, the more experimental and emergent the approach. Good take on the spectrum Ralph. You’ve outlined a couple here. There’s the level of innovation we’re talking (small incremental to radical). And the point in the innovation development process where a company is. The Verganti sense is particularly apt for radical innovations. But even less ambitious efforts to bring significant advances to existing experiences benefit from Verganti “make a proposal” type of thinking. In fact, a number of examples in his book were of that variety. Overall, you could almost look at the spectrum as a vaguely left-to-right flow of developing innovations. It wasn’t built to serve that purpose. It was more a statement of how much companies “invite customers in” to their processes. But if you bypass some parts of the spectrum here and there, you can see how elements apply to an innovation flow. A flow that better describes what you’re outlined here would be a good idea though. That’s an interesting thought, Hutch – this rough left-to-right flow sounds reasonable. While incremental innovation is more like optimizing the “world as is”, radical innovation seems to be more about building the world as it could be. In both cases, people’s needs are addressed but way and intensity of customer involvement is different. Very much agree here. Firms are still the ones that must own the proposals and the determination of where they want to go in the market. I get the sense from some critics (“Steve Jobs said customers don’t know what they want”) that talk of customer involvement in product/service innovation is tantamount to handing the roadmap keys over to customers. It’s an abdication of one’s growth responsibilities. A death sentence of product mediocrity. Not the case at all. 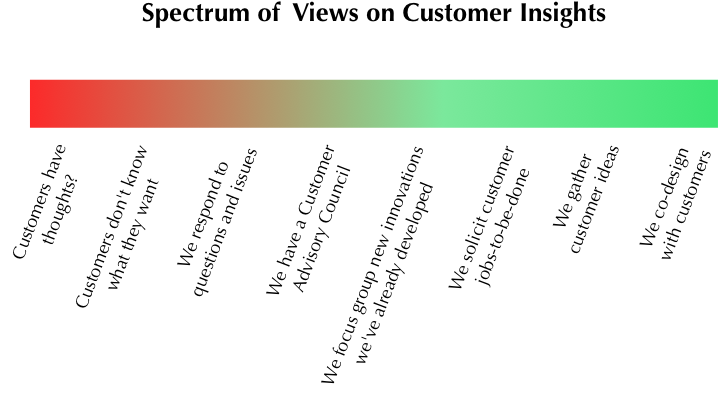 Rather, customer insight is an enriching source of information. Different insights, as you mentioned earlier, can be incorporated at different parts of the process. What’s new in customer-centricity is to advocate for the increased usage of these insights in the process. At least in my B2B experience, customers are itching to be more deeply involved. And product managers would readily accept greater engagement with customers as they flow through the conception, design and development of radical, major or incremental initiatives. I’ll assume B2C customers, at least in many sectors, would similarly be interested in being more involved. Great piece Hutch, as always. There is clearly a huge chasm between focus groups and opening up the doors of innovation to customers in a systematic and strategic way. It would be great to follow up on Ralph’s comment adding the kind of roles, actions and approach expected both from the organization and the customer at each stage. As a final thought, I’m not sure about the order and completeness of the last 3 more customer centric steps. Most companies, even those already attuned to innovation management, aren’t very well versed in outcome driven innovation and jobs to be done. That’s why co-creation and bottom-up participation aren’t always directed to the right goals and end up adding rear looking noise instead of building future competitive differentiation. Also isn’t co-creation a deeper but less scalable approach compared to crowdsourcing and thus its place in the continuum logically before innovation management? On the other side I suspect there may be some additional aspects worth to be considered such as: research communities (much better than focus group) during the product design and not after it, the engagement of employees to weight and refine customers’ ideas, etc. For sure, the right side of the spectrum is mostly untested ground. No, companies aren’t well established there. I put co-creation to the right of idea solicitation because it’s easier for companies to collect ideas than to act on them. Co-creation is a more active engagement with customers. The spectrum wasn’t attempting to plumb levels of scalability as much as it was to define the depth of customer involvement in internal processes. Good points on research communities. I guess the closest “accessible” things companies might have today are user forums, really. And yes, employees are quite valuable! I just kept the focus here on customer involvement.